This extension implements a responsive vertical timeline. A timeline is a component which can be used to display content in chronological order. It's great for sharing a story of your projects or a roadmap of its development. For example: Company history, a project roadmap or a visual presentation of how your portfolio evolved. Each timeline item can have a title, sub-title (for example: date), description, icon and a button link to another (more details) page. 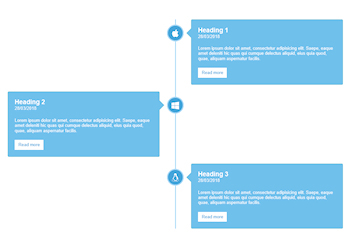 The timeline can be used in responsive layouts (with breakpoints) and layout grids.